This was an evening to remember! 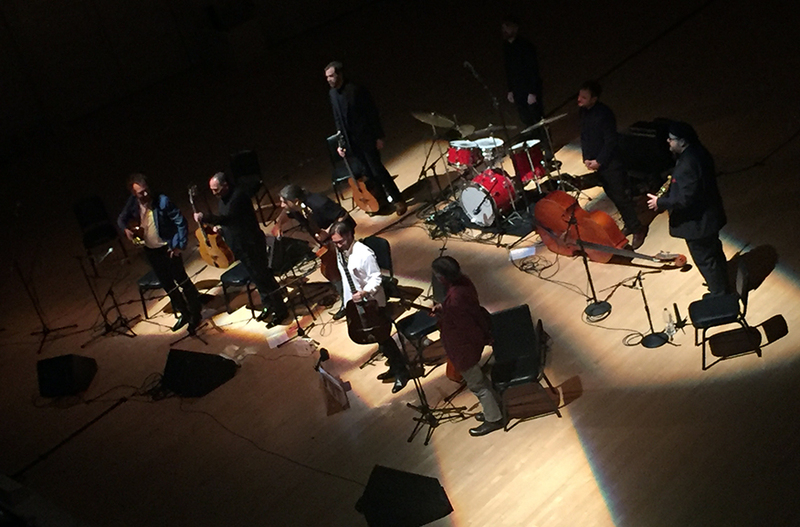 As I mentioned last month, I was psyched for this concert and I can say now that I had a fantastic time at Django a Go Go and saw some GREAT live Gypsy Jazz in one of the best venues in the world (Carnegie Hall)! It seems the accompanying bandcamp and smaller concerts out in Maplewood, New Jersey were also well-attended and a roaring success. While talking about it from the stage, organizer Stephane Wrembel described the whole idea as “CRAZY”, but it worked out beautifully. Stephane has been playing/promoting these concerts since 2004 so he is definitely adept at pulling all of the necessary elements together and had all of the right kind of help. 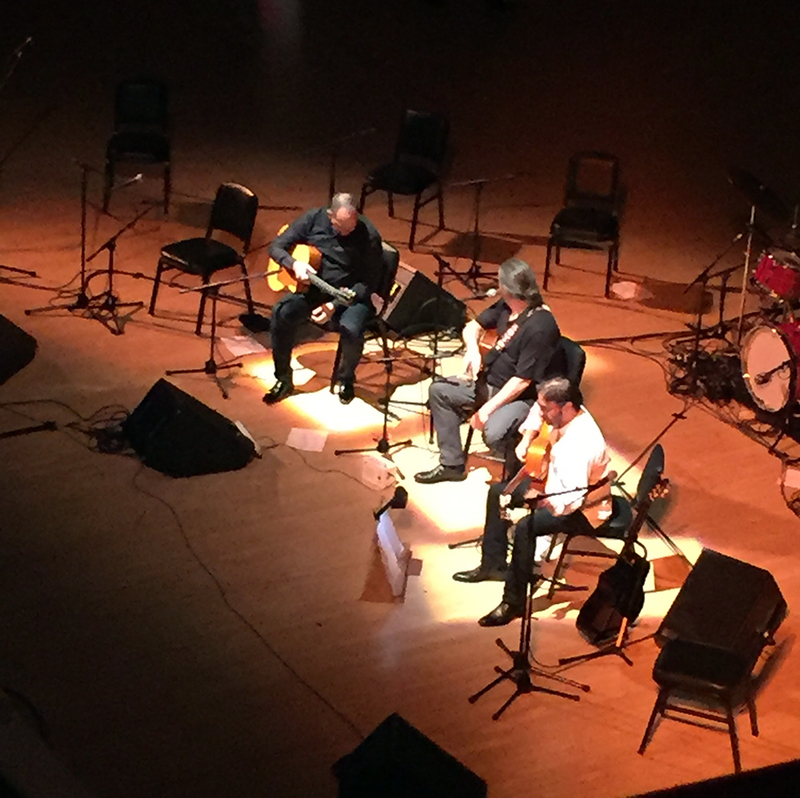 Gypsy Jazz is more popular than ever in New York City! 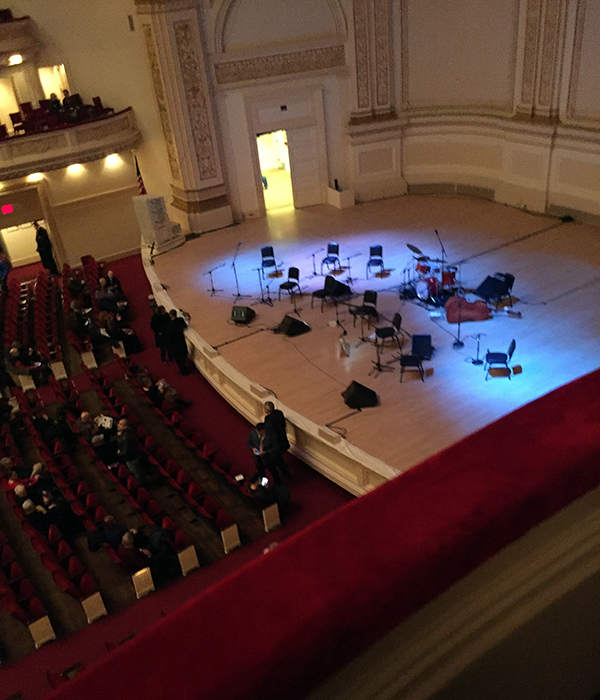 My girlfriend and I arrived at Carnegie Hall, had a nice glass of wine, checked out some of the history in the place at the museum and then made our way to our seats at about 7:30. 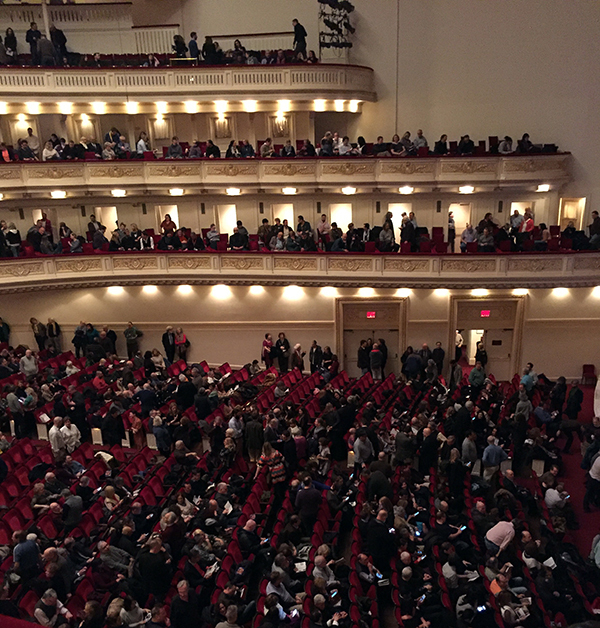 Together we have seen some great shows at all of the big venues in New York over the years, but neither of us had ever been to Carnegie Hall. What a great place. So much history and a part of a very different time, yet it remains so functional in the modern era. The view from our seats was awesome — completely unobstructed, which is just what I was going for. While I’ve seen people say that the show was sold out, that isn’t completely true. Our area of the balcony was not, which was GREAT! We could really stretch out and enjoy the show and the others who were around us were cool and likewise had plenty of room. I knew the sound would be amazing. It’s Carnegie Hall! While the above pic might make it seem like the 2nd balcony is too far away, it really wasn’t. As I have mentioned on this blog in the past: it was Django Reinhardt’s 1953 version of Night and Day, this video of Stochelo Rosenberg and seeing Stephane Wrembel live that inspired me to learn Gypsy Jazz. I’ve seen Stephane in many incarnations over the years, but have never seen Stochelo. I have also never seen Al Di Meola live and so this was what I was psyched for going into the concert. Stephane started the show to great cheers from the hometown crowd and after acknowledging the importance of the night and his thanks to the fans, began the show solo with his sublime version of Django’s Improvisation #1. His band joined him on the next tune, the very kinetic original number, Prometheus. As always, Stephane’s playing was brilliant and his band was great. They totally nailed the tunes and then provided great backup for everything else over the course of the evening. Nick Driscoll joined in on saxophone for a great Coltrane-type version of Django’s Troublant Bolero. Totally cool. There was some singing from David Gastine who did a Jean Sablon tune and then related that his dream had always been to sing Take Me Home, Country Roads at Carnegie Hall. Hmm. Not what one would expect at this show, but he nailed it, had people singing along (including us for a chorus [blame the wine]) and got a big ovation for a job well done. Stephane also played Bistro Fada, his very well-known theme for Woody Allen’s Midnight in Paris movie. Then they were joined by guitarist Larry Keel who played some serious Doc Watson country style guitar. The show reminded me of an old-time variety show or maybe Prairie Home Companion. Stephane explained that this has always been the theme behind this concert; bring many divergent styles and musicians together and make it happen! Then it was time for Stochelo Rosenberg and he did not disappoint. He was CHARGED! He explained before starting that he hadn’t been to Carnegie Hall since 1993 when he was invited by the great Stephane Grappelli. Twenty-four years later he returned thanks to another Stephane and completely burned through his original, modern Gypsy Jazz classic, For Sephora. To see and hear him play this song live was an incredible experience. Everything I wrote about in this post regarding Stochelo’s incredible technique; his strength, touch, tone, and articulation was on full display. Even the other musicians onstage were just shaking their heads as he blazed through 4 choruses of the tune. It was brilliant! It was awesome! They followed up with a Django-era classic, Coquette that also sounded great! I could see everything Stochelo was doing and he was very animated and having a good time, which is a bit unusual for him. Usually he lets his hands do all the moving. Al Di Meola came out next and related that he too had played the hall 42 years ago with Chick Corea and also hadn’t been back since. He launched into a very dramatic classically-inspired solo piece that went through many movements before coming to a big climactic ending and then the ensemble finished with a blazing version of Indifference. During this tune, Stochelo, Al, and Stephane did all kinds of tag-team soloing and comping that was a prelude of the great things that awaited us in the second set. It was a pretty amazing first set and the show had already run more than an hour and a half. And it only got better! After a short intermission, Stephane, Stochelo, and Al came out alone and Stephane related before they began how influential the Friday Night in San Francisco recording of Di Meola, Paco De Lucia and John McLaughlin from 1981 was to him and to many guitarists he knew. (It was to me too). I was expecting they might do this and as soon as I saw the three of them come out I knew they would! They launched into Mediterranean Sundance and it was EPIC! No, really, it was so good they all hugged at the end of the 12-15 minutes worth of awesome playing. I am not even going to describe how epic it was, but the playing from all three was magnificent! They followed it immediately with a great version of Chick Corea’s Spain joined by Keel and bass player Ari Folman-Cohen. Crazy good. For me everything that had happened between when Stochelo appeared and the end of Spain alone was worth the price of admission. But there was more! A great swinging version of Django-era Georgia on My Mind, with Stochelo playing all of Django’s brilliant lines and chordal fills and It Don’t Mean a Thing with sublime Freddy Taylor-type vocals on both by Ryan Montbleau. Then there was a great guitar hero version of Nuages (with a solo intro by Stochelo to open) that also featured some more great sax from Nick Driscoll. Finally, there was the big rave-up at the end with the Gypsy Jazz anthem, Minor Swing that included the great Paulus Shafer and Stephane’s student, Sara L’Abriola, that succeeded in bringing down the house! 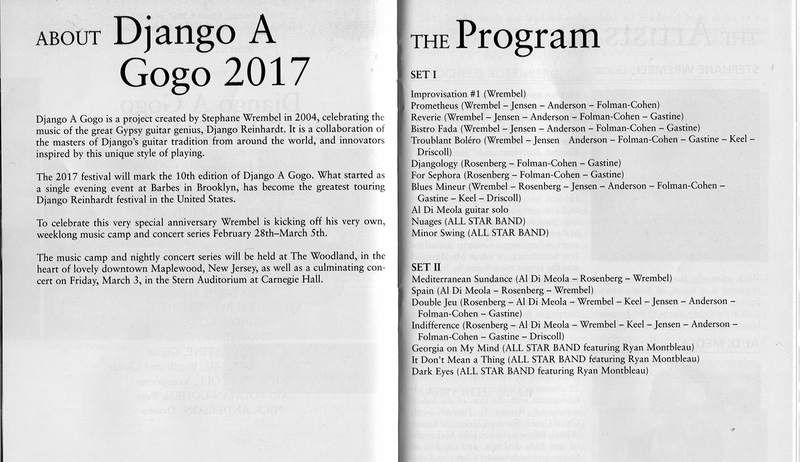 The week after the concert I saw this page of the program (didn’t look at it the night of) and this review from Downbeat and both show a program I totally don’t remember in spots, but I think I’m remembering correctly. I know that Coquette was played because Stephane briefly introduced it as a song Django wrote (which he didn’t) and that had Stochelo shaking his head no (because he didn’t) while if they had played Djangology, that would have been true, since that is a Django Reinhardt composition. Minor Blues was definitely not played and neither was Dark Eyes and if Double Jeu was played it was worked in as a part of Indifference because I know Double Jeu from that awesome Romane/Stochelo Rosenberg DVD that I have raved about on this blog a number of times. Anyhow, I’m sure there had to be some alterations and spontaneity and that is what jazz is all about! Finally, as I wrote here, I lost my mother almost a year ago to the day of this concert. She was always my Number 1 musical supporter and over the years I was able to take her to many different cultural events in NYC, which she always enjoyed. 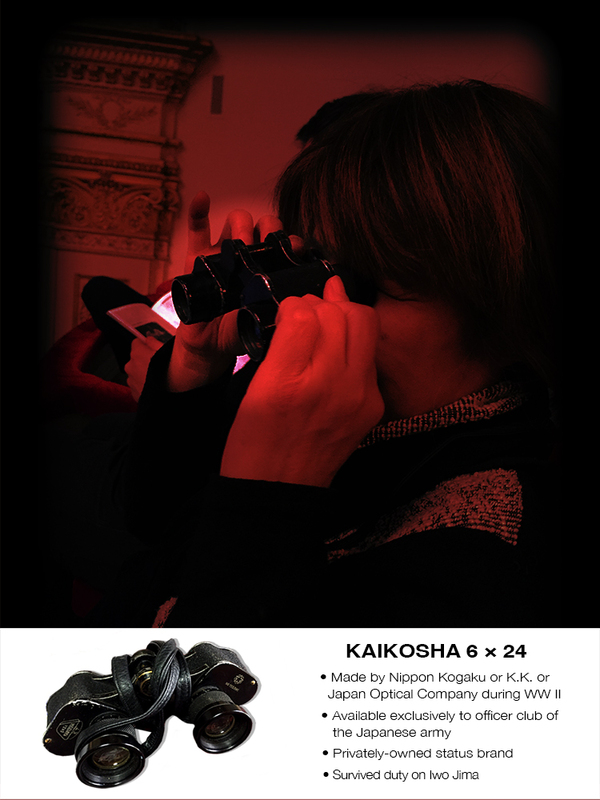 We never saw anything at Carnegie Hall though, but I like to think she was with me for this great night of music. My girlfriend lost her father about six months ago. He lived to the ripe old age of 94 and while that is quite an accomplishment in and of itself, the fact that he was stationed on Iwo Jima with the Japanese army when he was but a lad of 22 makes it all the more amazing. He was wounded in an air raid and was evacuated from the island before the final American assault. One of the bullets that struck him remained in his leg for his entire life. He passed away just after I bought tickets for Django a Go Go and bequeathed the field glasses from the his army days to his daughter to use for the concert. We were able to get up close and personal to some of the action on stage and that was great! After all of these years, and so many miles, they still work and he would’ve appreciated that they were put to such good use. Swords into plowshares and all of that. I felt very fortunate to have been a part of this evening with so much great music and great playing by all of the musicians. Of course, it was a monumental night on a personal level for me to see Stochelo! I am also glad that Stephane took it all on and set up such a great program of events and hope to see more in the future!